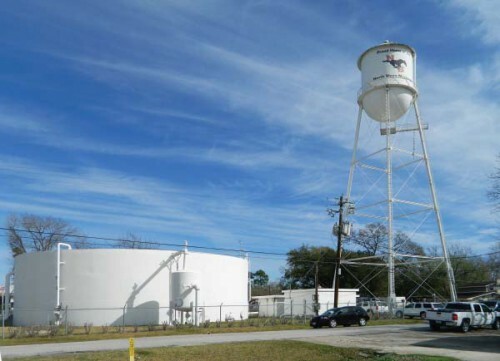 Harris County Water Control & Improvement District #36 has a water storage tank facility at Freeport and Brownwood streets. There is both a ground storage tank, an elevated tank, and pumps and emergency generators at the site. In the coming months, the Water District will remove the elevated tank and replace it with a much larger new tank. The old tank is over 65 years old, and needs replaced. CLOVERLEAF – Customers of HC WCID#36 will soon have an upgrade in their water service, according to general manager Billie Vasquez. 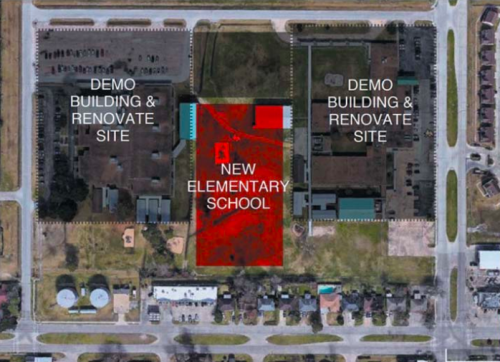 The District is planning on replacing their old elevated storage tank with a new one, with a larger capacity. The old tank, purchased from the “Old Ordinance Depot” in Jacinto Port over 65 years ago, had a capacity of 150,000 gallons. It has been refurbished and standpipes have been replaced over the years. The new one, being built in South Dakota by Maguire Iron, will have a capacity of 250,000 gallons. It will be erected by the contractor, W.W. Payton Corp., this summer after the old tank is tipped over and replaced. 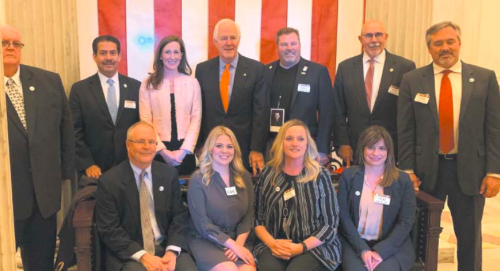 The project is jointly financed by a HUD/CDBG grant from the Harris County Community Services Department of $1,178,622, and a matching grant from the Water District of $295,000. 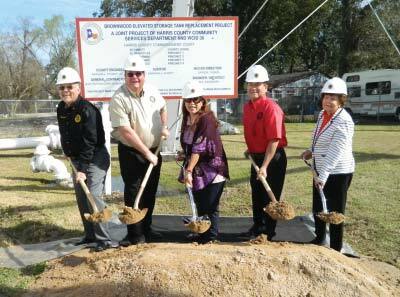 Board members of HCWCID#36 break ground, symbolically, for the new Elevated Storage Tank. Pictured left to right, Gerardo Leal, Ronald Holder, Maria Koukoulakis, Gerardo Parra (president), and Ola Mae Watts. Water District Manager is Billie Vasquez. Vasquez says there are approximately 4000 customers of the district, with water and sewer service. The new tank will allow the district to move to 80% surface water, rather than 60% currently. The balance of the water comes from wells, she said. The water district has existed since 1942, created by the Harris County Commissioners Court. It was originally known as Fresh Water Supply District #14, and then later WCID#36. It should be an interesting sight, when the old tank is taken down and the new one erected this spring.